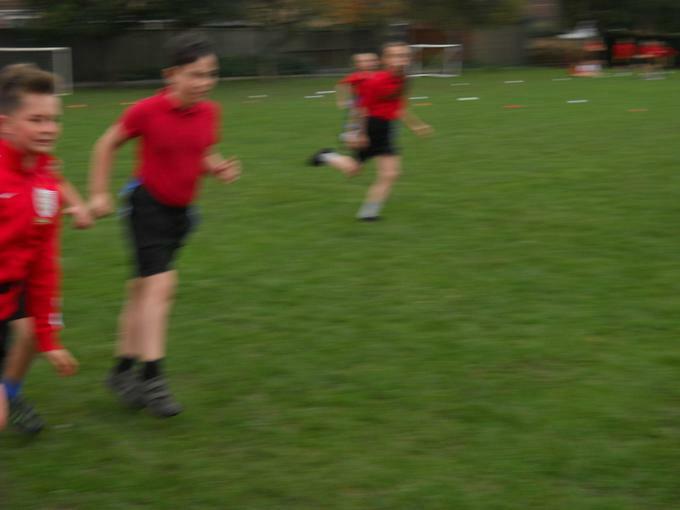 At Grove Primary School children from time they start in the Early Years children are encouraged to take part in physical activity to promote their social and physical well being. 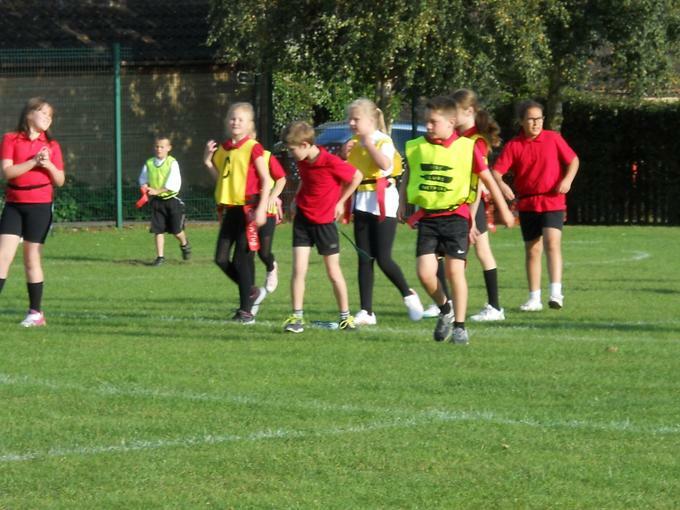 From KS1 onwards, all children take part in two Physical Education lessons a week. 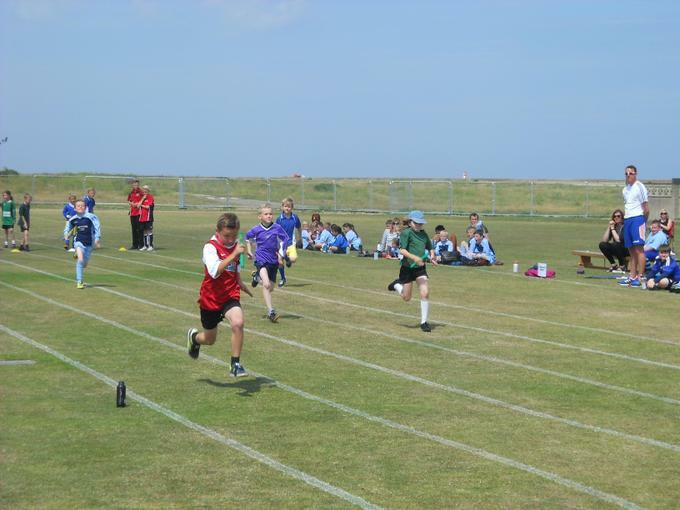 PE helps children to develop a range of physical skills including body awareness, balance, co-ordination and agility. 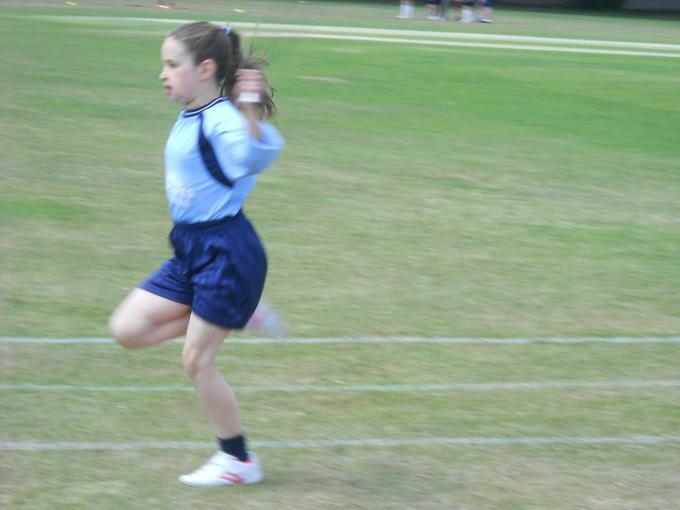 In addition, PE also helps to develop children’s confidence through working as part of a team. 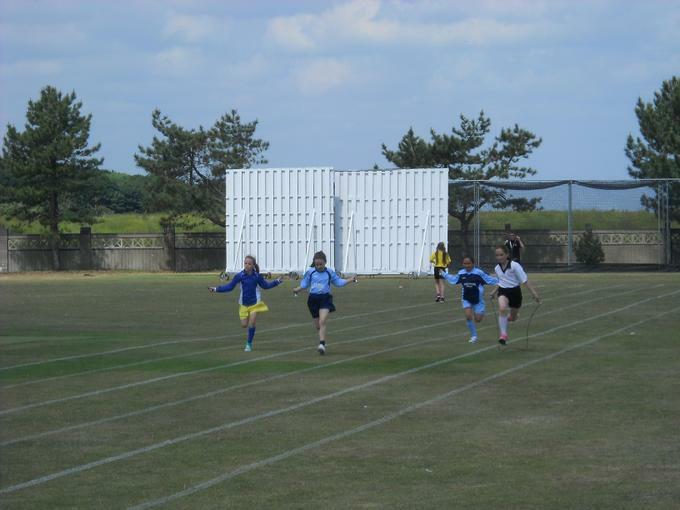 The PE curriculum is taught through games, athletics, gymnastics, dance, outdoor adventurous activities (OAA) and swimming. Children from Nursery to Year 3 have the opportunity to swim in our school training pool during the second half of the summer term. Children in Years 4, 5 and 6 take part in swimming lessons externally. 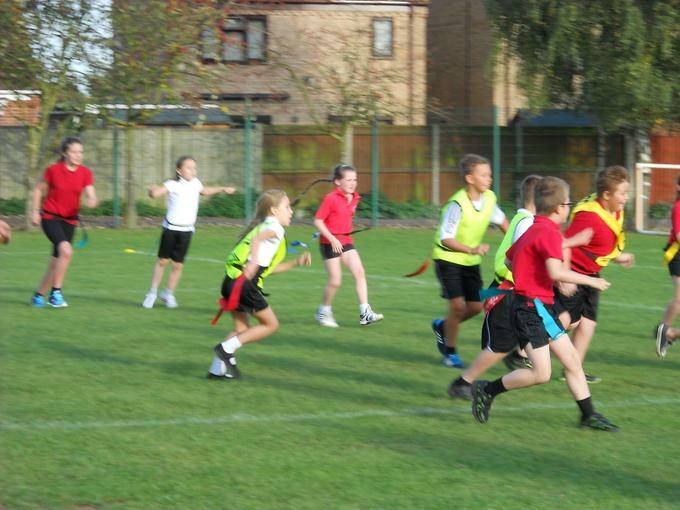 In addition to the formal curriculum, the school also participates in local primary school tournaments for a range of games, across the hub and supported by the Local Suffolk Schools Partnership. 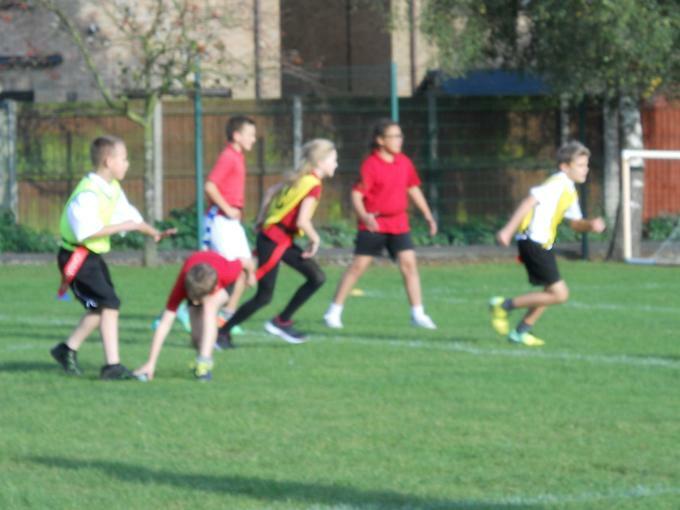 We also encourage children to participate in extra curricular clubs, during breakfast, lunch and after school clubs. These are posted termly so please inquire if your child is interested. 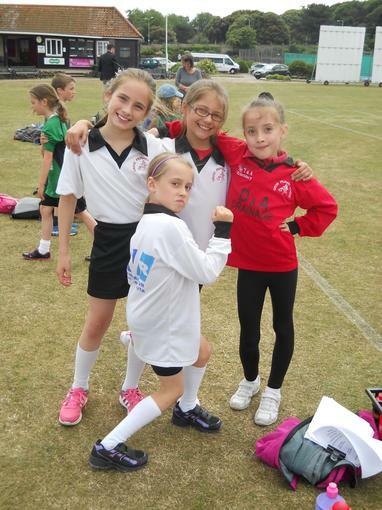 Year 5 and 6 girls had a fabulous time at their first football tournament playing against ALT hub schools. 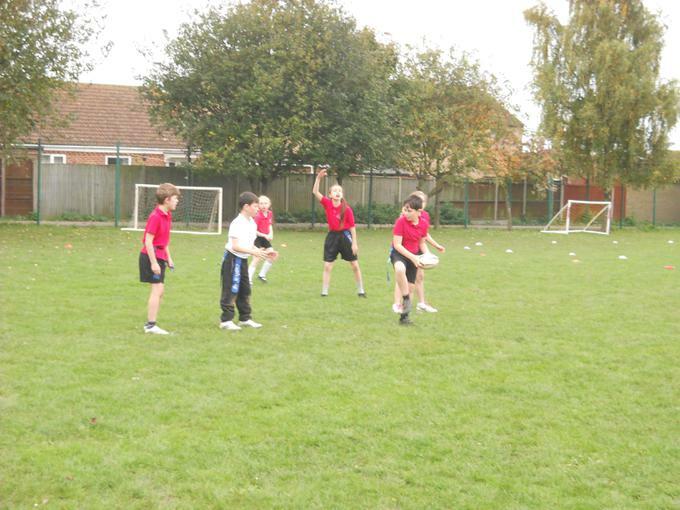 They were super enthusiastic and displayed a wonderful approach to each game improving with each match. Thank you to all the parents who supported the girls. Well done! 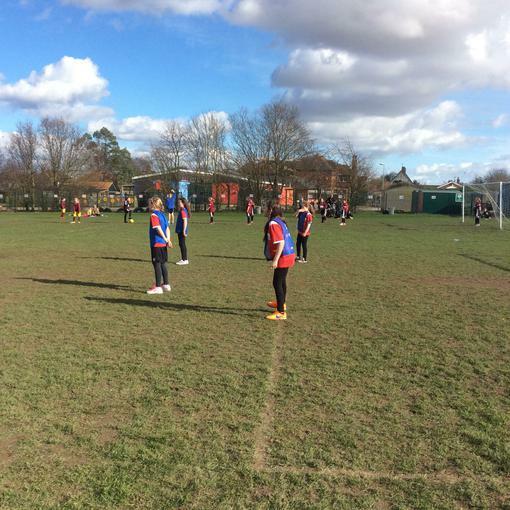 Two teams played in the North Suffolk ALT Football tournament playing five other schools from the area. 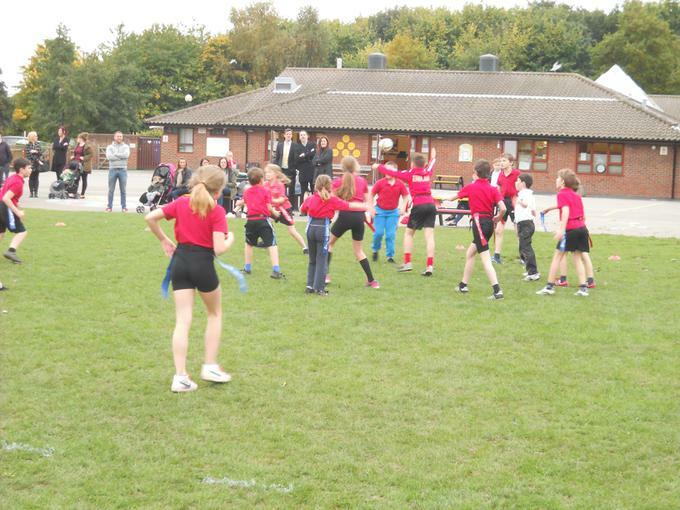 Both teams performed well in their respective groups, with the Tigers playing some amazing passing football. 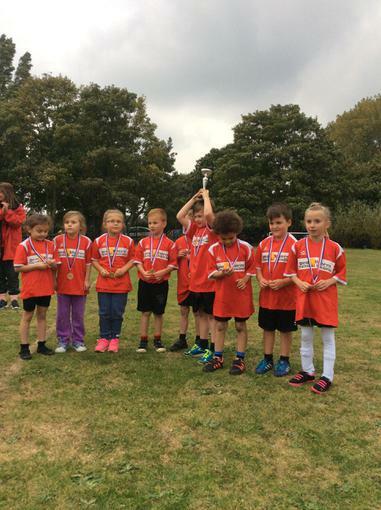 The Panthers only lost one game and came away with the trophy! 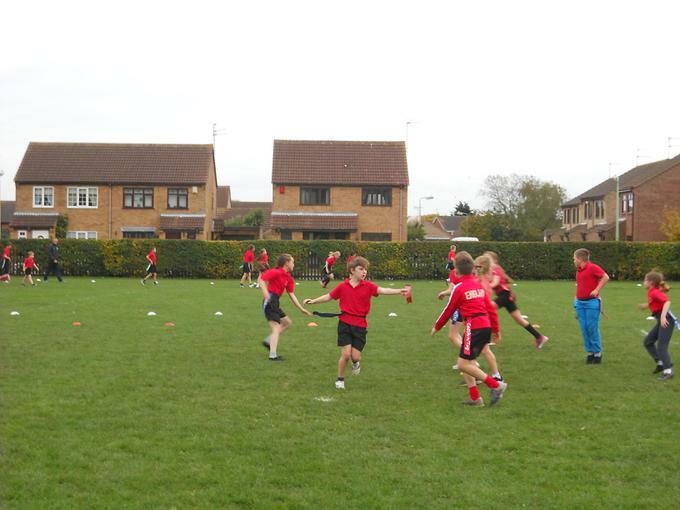 Well done all who took part on a grey evening. Once again the parents who attended were resilient and didn't flinch supporting their children through the rain, super proud of all the children and parents . The sun did come out as we left! Over the Christmas holidays the pool area has had a makeover! 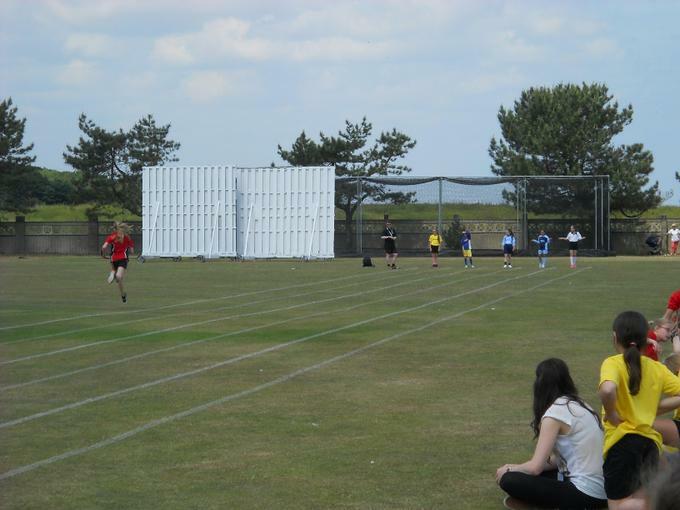 We are now able to offer undercover outdoor P.E. and the children are loving it! 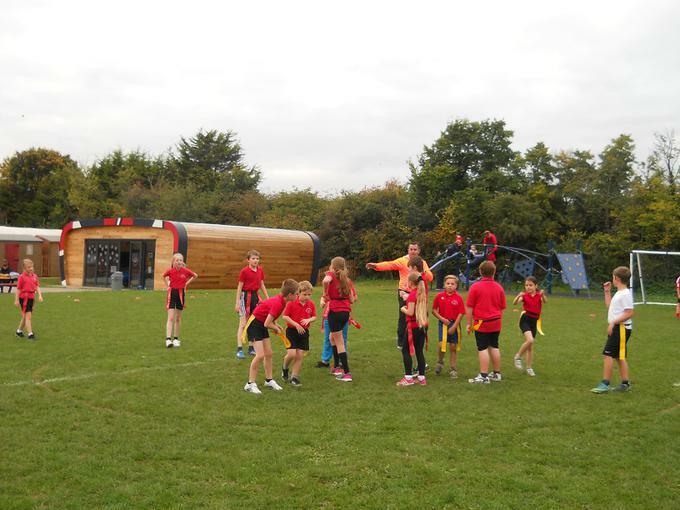 We have been able to offer a greater variety of lunchtime clubs and they have been taking advantage of the facility daily. 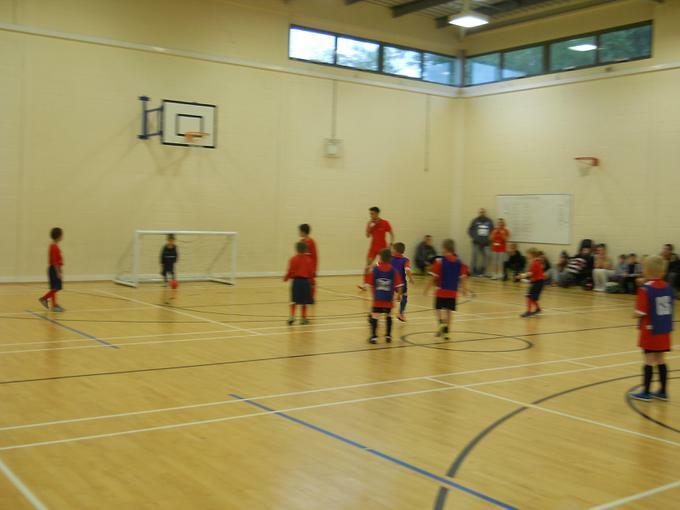 Also we have a space for after school clubs and now are not limited to the hall during the winter months. 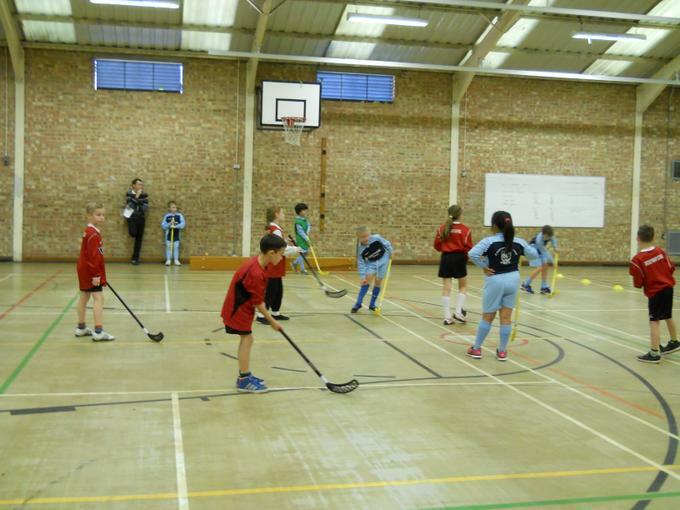 Two teams from Year 5 attended the ALT hub hockey tournament, playing against 5 other schools. The games were once again really close with the A league positions being decided with the last game between Grove and Red Oak , both teams needing to win to be placed second. 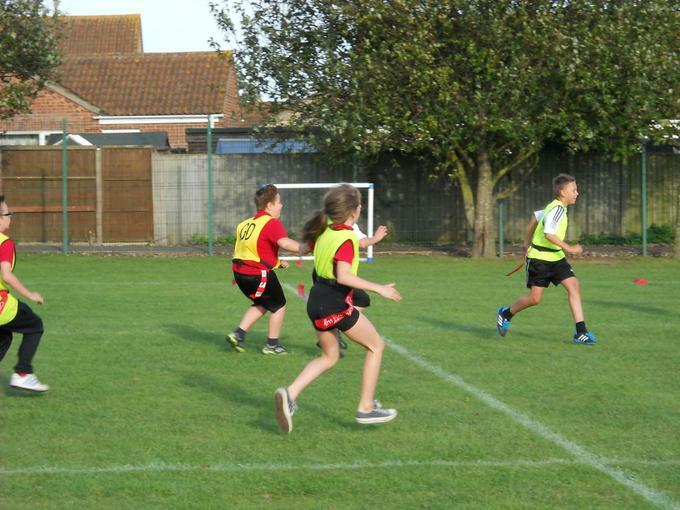 Despite great effort the game result was a 0-0 draw. 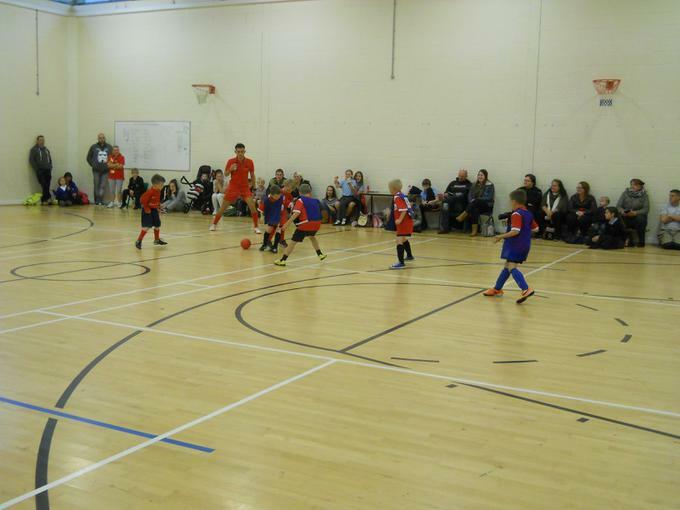 The team contesting the B league had a fantastic goal fest in one of their games winning 8 -nil! 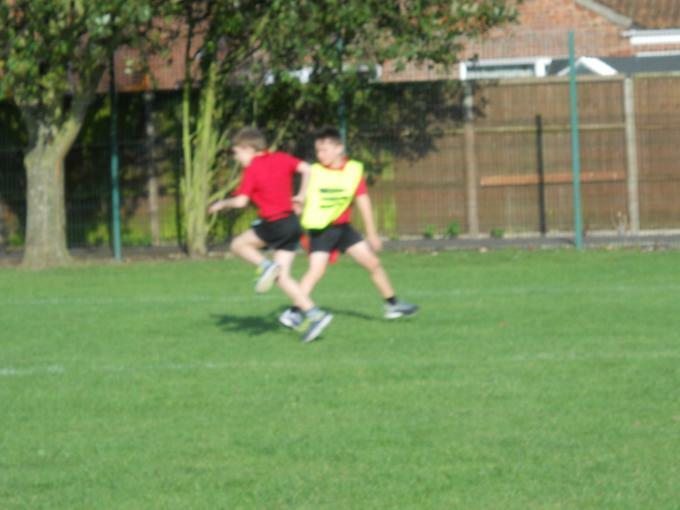 Grove were placed third in each league another brilliant effort by all taking part. 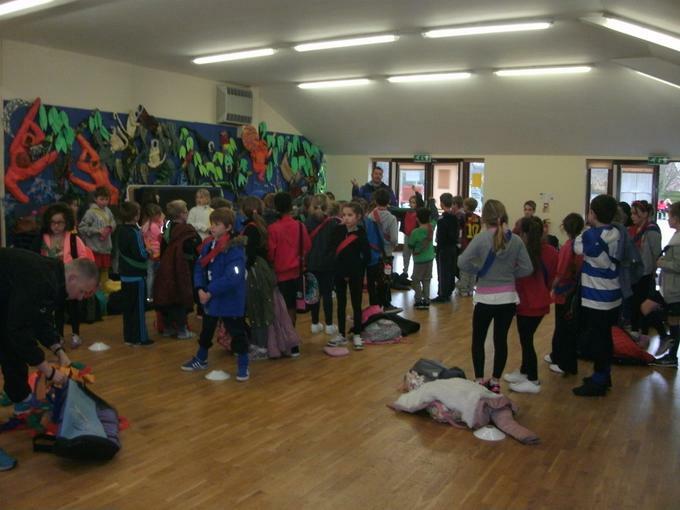 A special mention must go to all the parents who supported the children on a wet, windy and very cold evening. 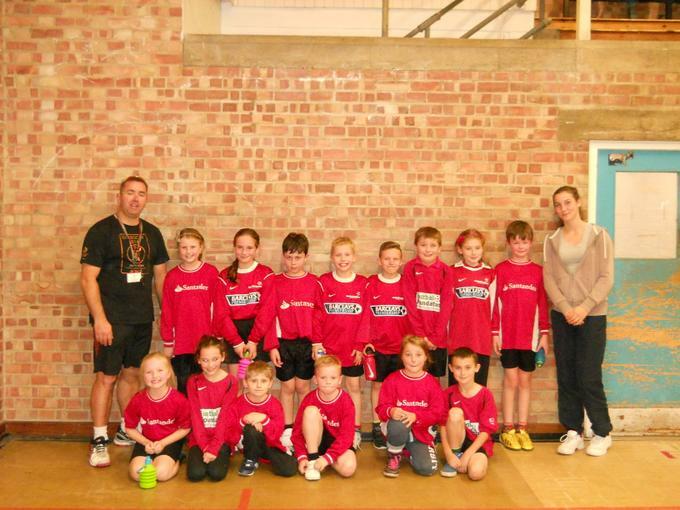 Friday the Year 4 children attended a tournament playing against other ALT schools at Red Oak. 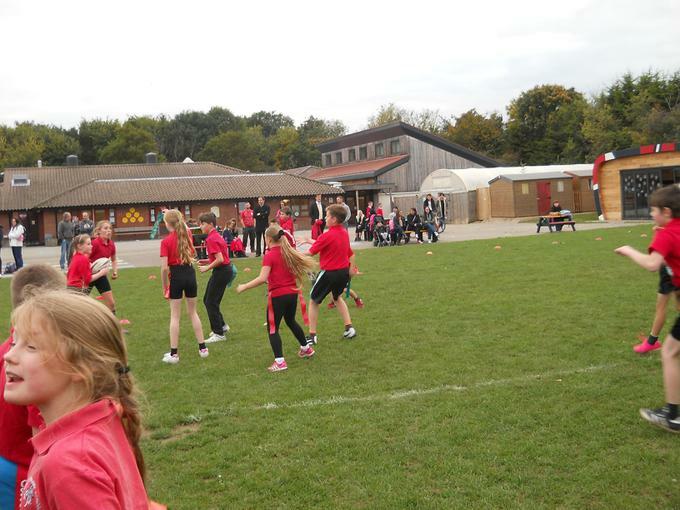 They were even games with all of the teams present showing great sporting conduct and enthusiasum, even though some were really cold playing on the outdoor weather pitch. 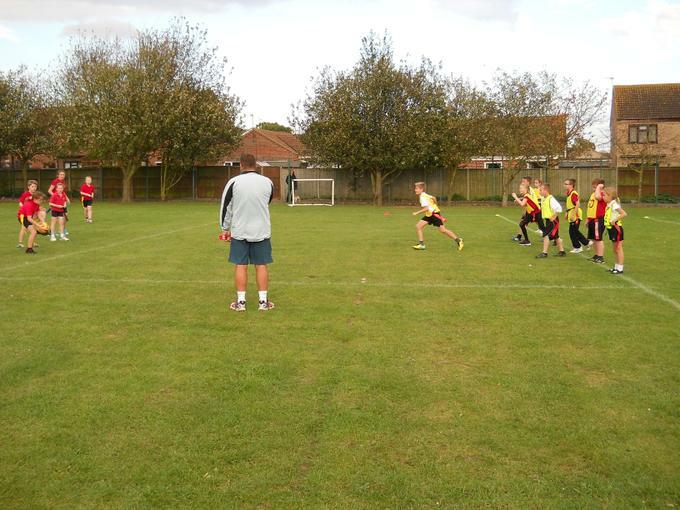 The parents were a bit chilly as well but as ever showed unwavering support for both teams. 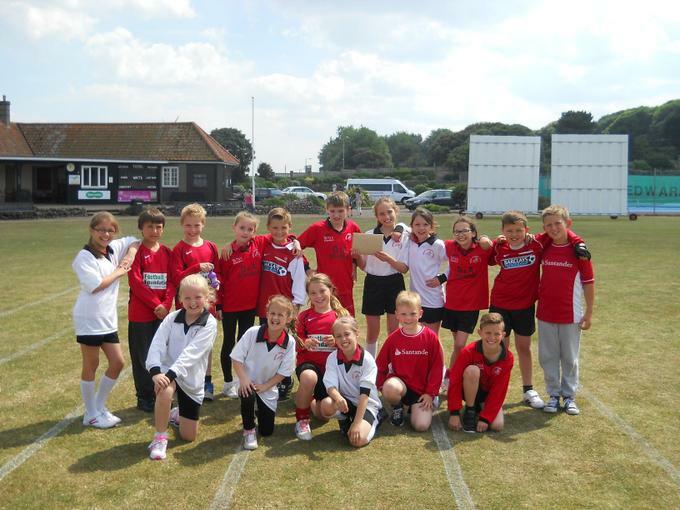 Both teams came third in their leagues - WELL DONE! 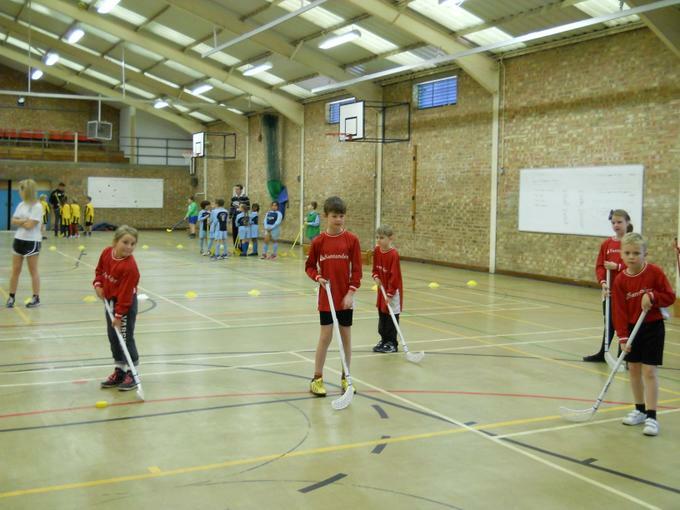 Year 4 children, two teams, travelled to Red Oak to play in a uni-hoc tournament. 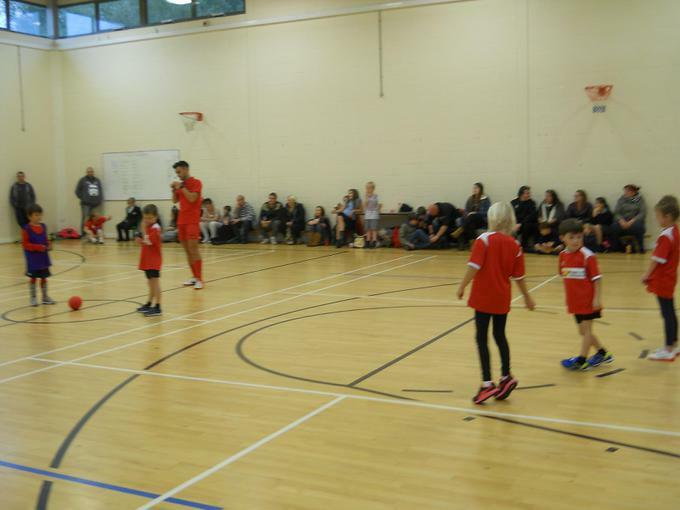 Playing in the purpose built sports hall provided a fast paced game and all the children demonstrated the ability to adapt to the new play situation and adapt their game accordingly. 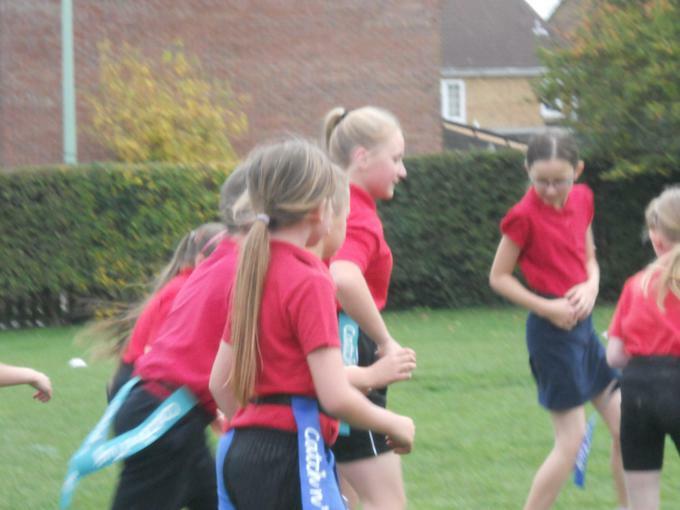 They demonstrated great sportsmanship during and after the game, which was noted by the other people attending the tournament. 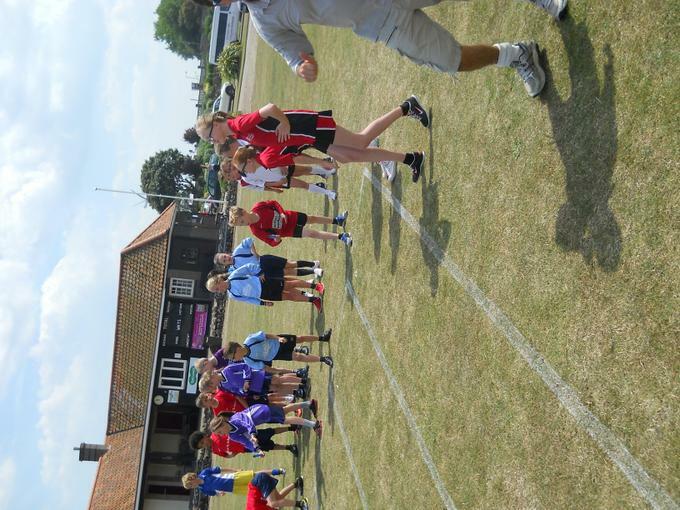 Very proud of all who took part! 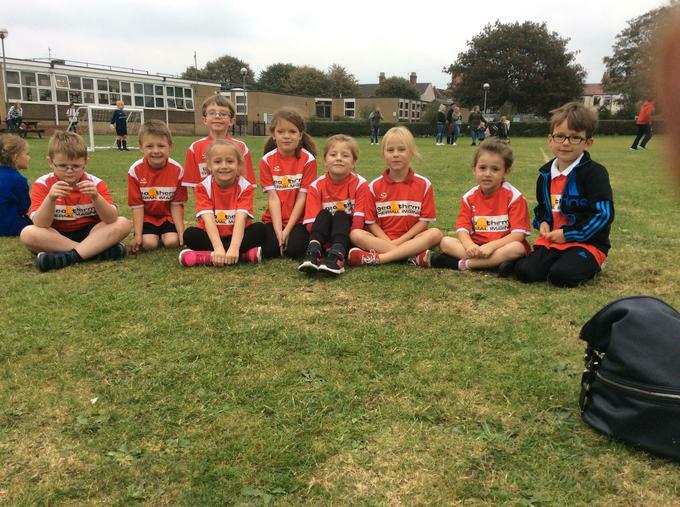 Two teams of super eager Year 1 and 2 pupils travelled to Red Oak to take part in their first football tournament. They played really well, and enjoyed the experience immensely. 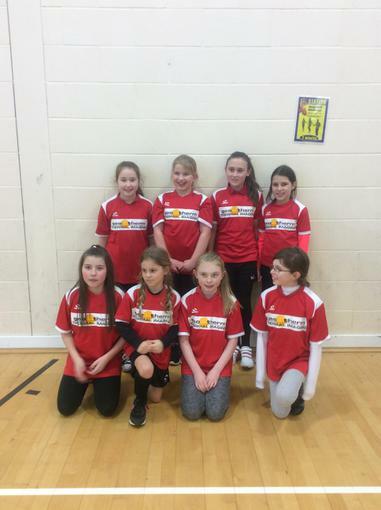 We were very proud when both teams came away as runners up in the A and the B league. Well done to everyone. 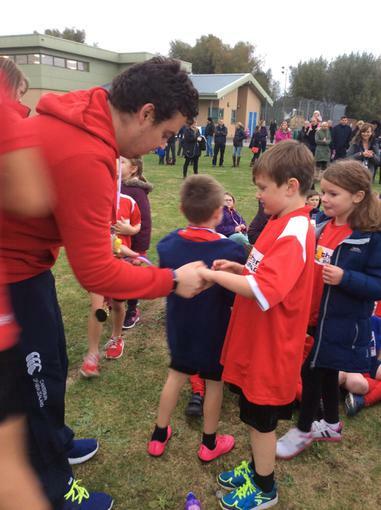 Thank you once again to our wonderful families who made the effort to come and stay supporting the children. 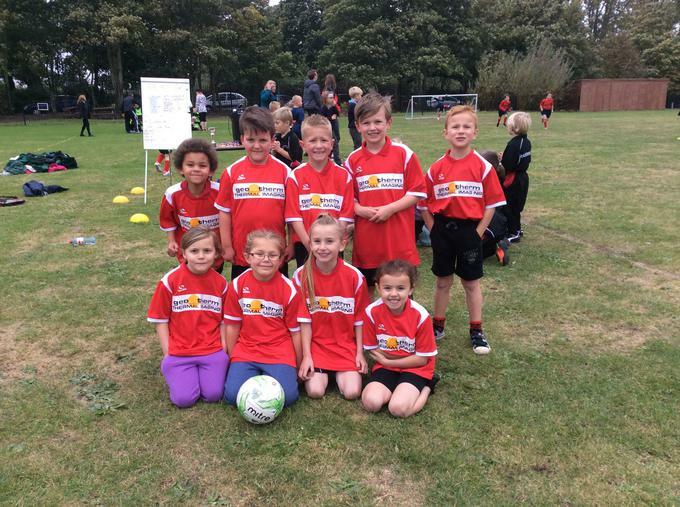 We entered two teams in the North Suffolk ALT schools football tournament for Year 3 children. 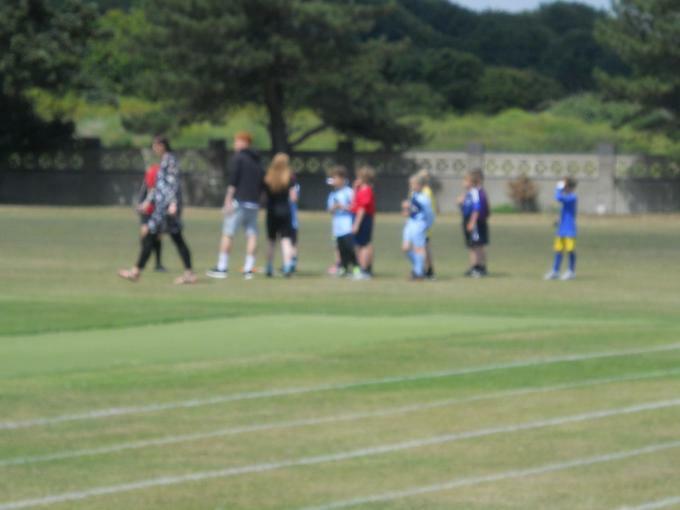 The games were 7 a side and played over 5 minutes. 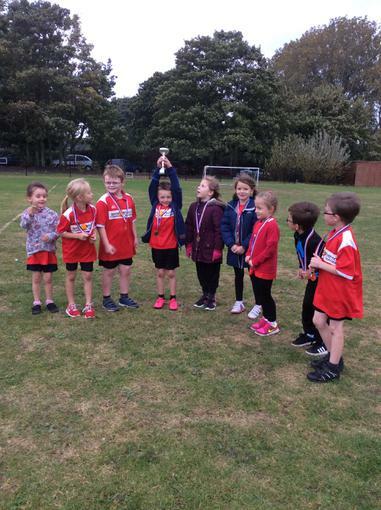 All of the children attending behaved excellently following the Golden behaviours and representing their school in the highest standard of sportsmanship. 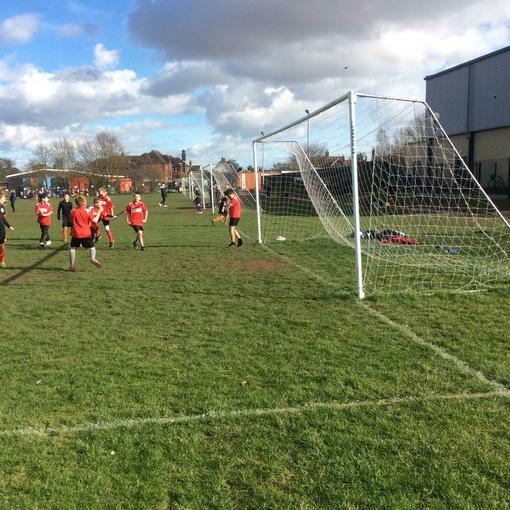 We had some very close games many of which were goal less draws due to the stunning saves of our goal keepers, Freddie Darleston and Adam Fuller who both earned themselves Man of the Match accolades. 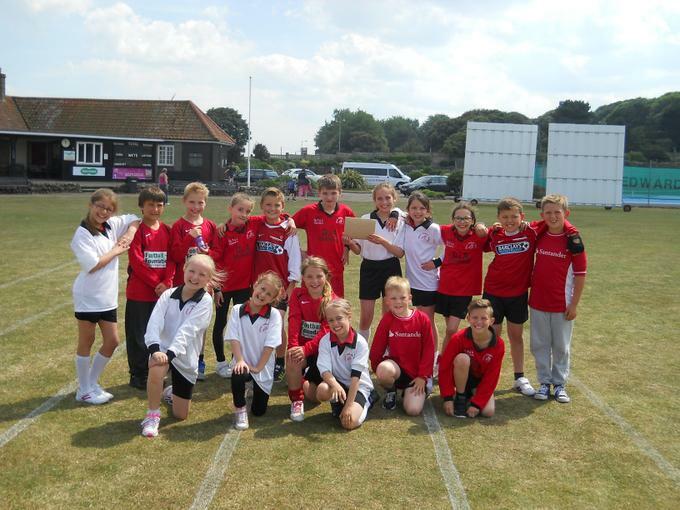 The B team only lost to the eventual winners Pakefield, and the A team won their league to lift the trophy. Well done to all . 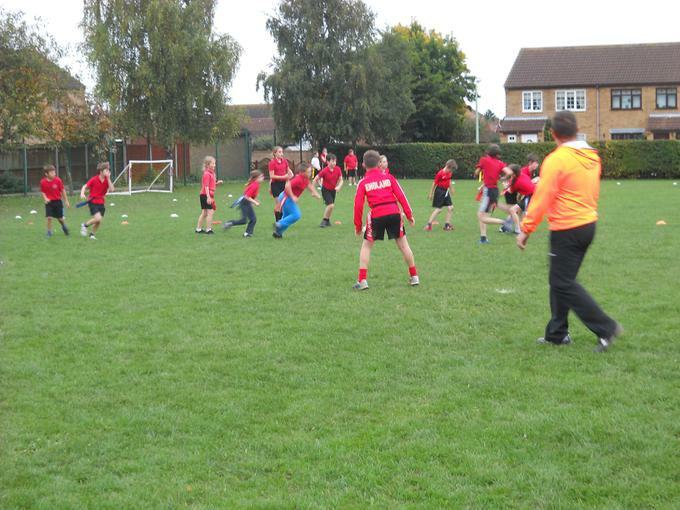 A special thank-you must go to the parents who stood and supported in drizzly weather- Thank you! 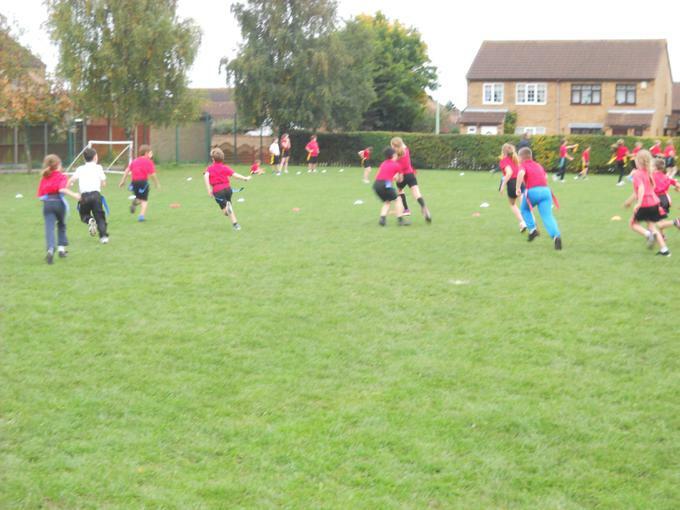 Year 5 girls participated in the ALT football competition at Red Oak. The team played well and enjoyed the experience. 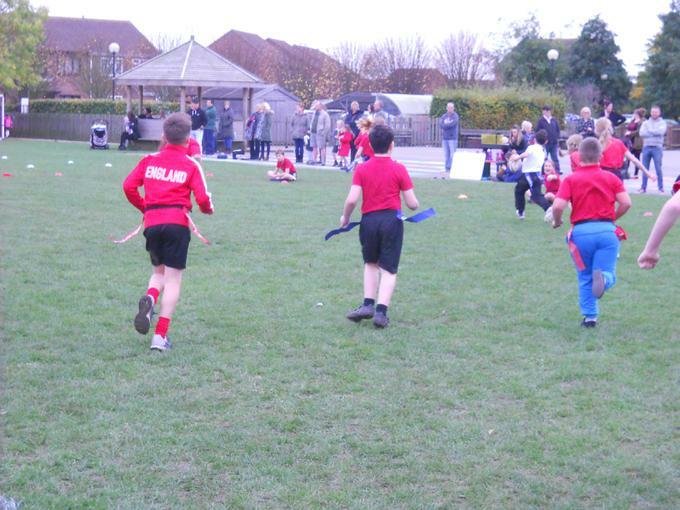 Year 4 pupils participated in the ALT competition at Red Oak. 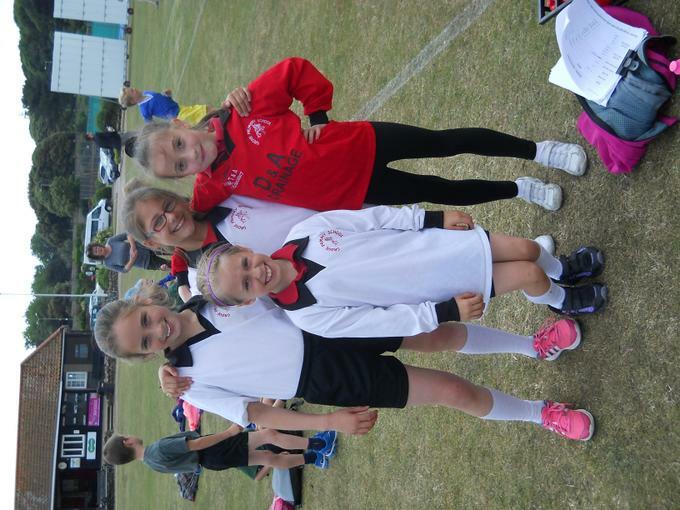 They played well and enjoyed playing against other teams. 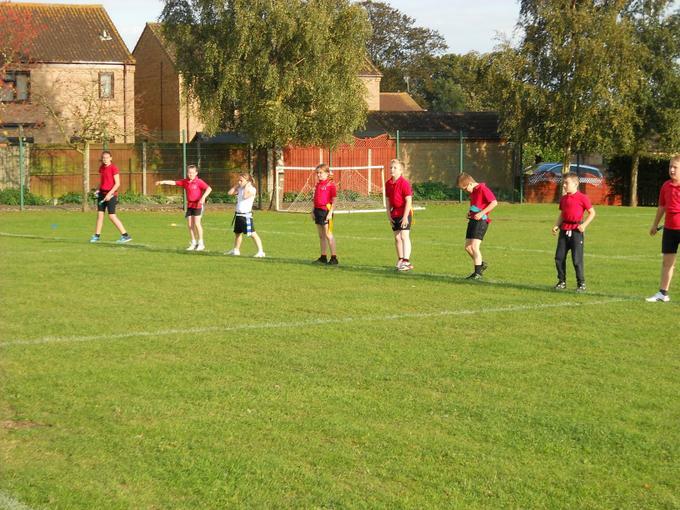 14th October - well done to the A and B teams who won their tournaments. 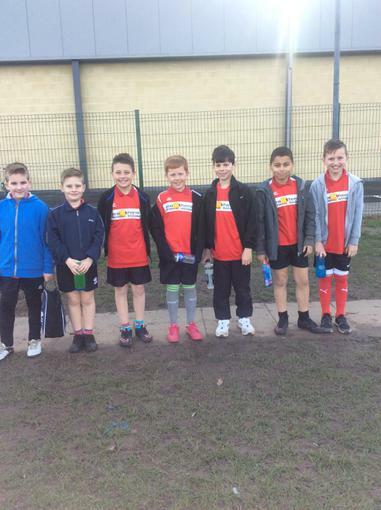 Well done to everybody who played in the year 5 football cup. 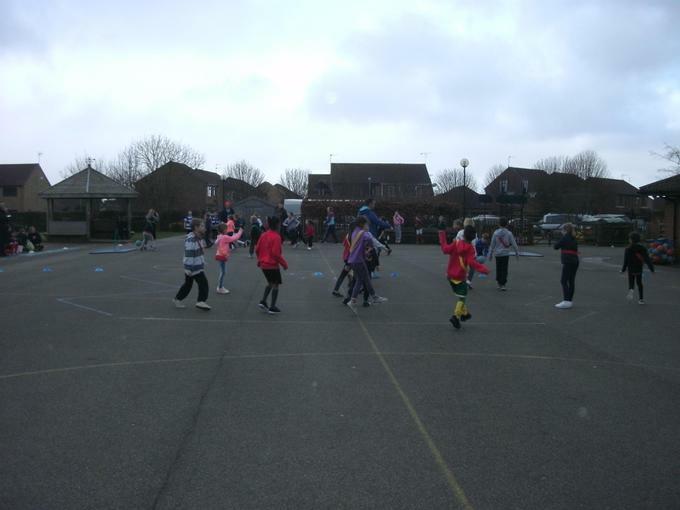 Despite quite soggy conditions, everybody tried really hard and played all the games. All the pupils involved received certificates for participation. 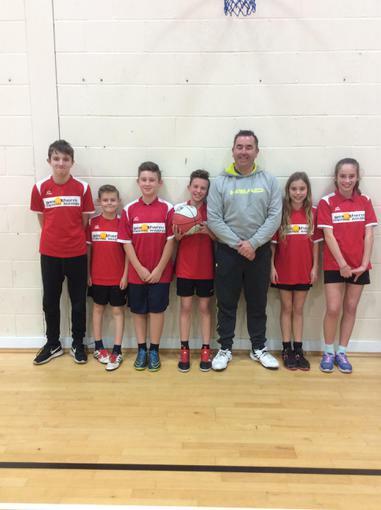 Today four children from Year 5 participated in a doubles badminton tournament at Sir John Leman High School. 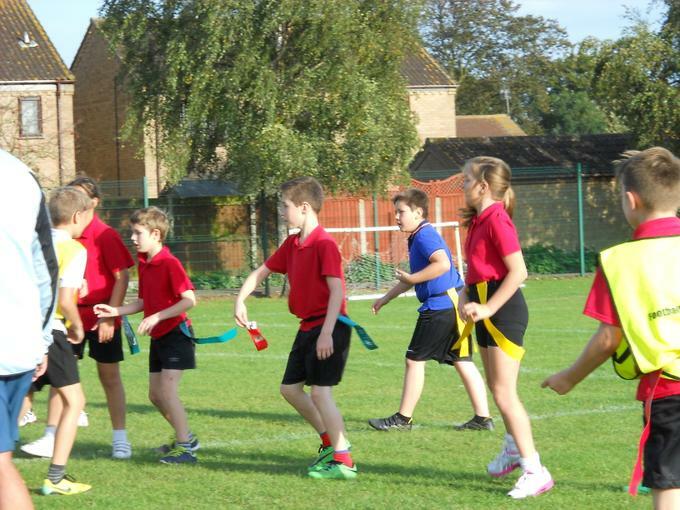 Each pair played against six other primary schools. 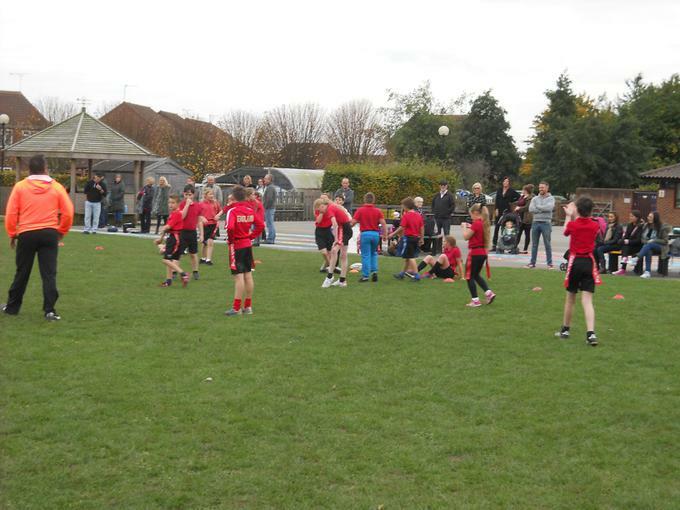 All of the children played brilliantly and represented Grove Primary school in a fantastic way. The boys finished the tournament in fifth place overall. 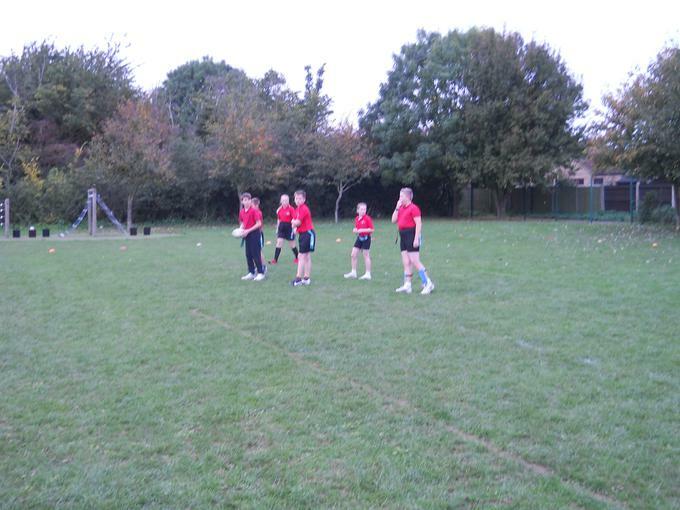 The girls were unbeaten! They finished winners of the whole tournament and received a medal each. Well done! 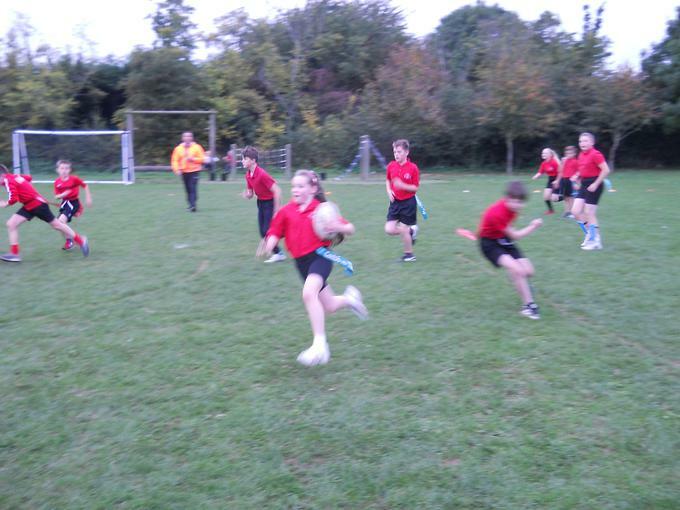 After school today all children in Year 5 and Year 6 were invited to a friendly Tag Rugby tournament at Grove. 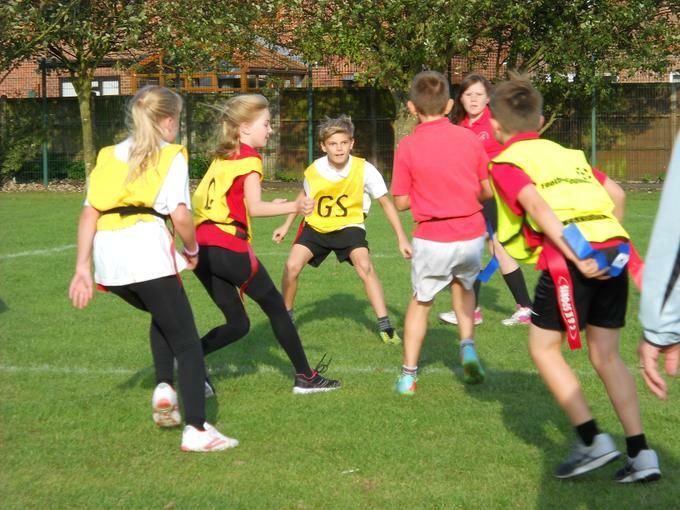 They have been learning and developing the skills of Tag Rugby in their P.E lessons so it was a great opportunity for them to apply what they had learnt! 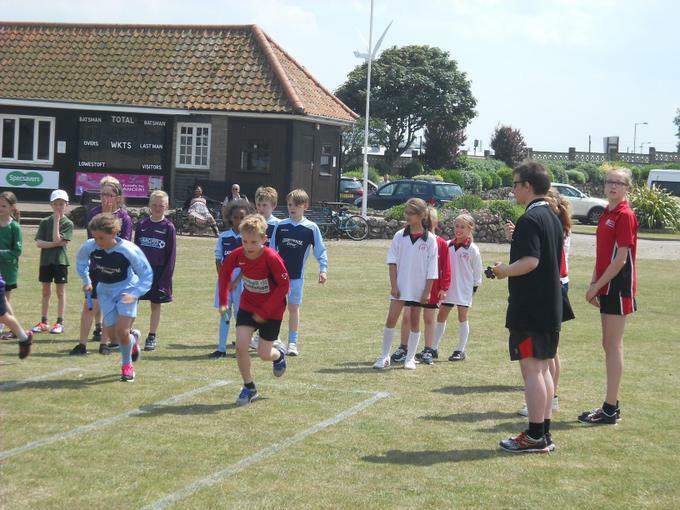 The children were divided into their house teams and they competed against each other. 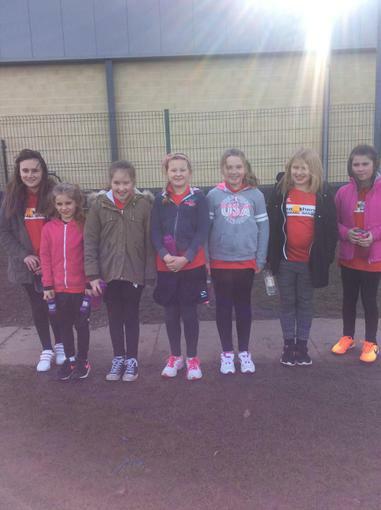 Well done Ruby team who won overall. A fantastic time was had by everyone. Wow! What an incredible day! 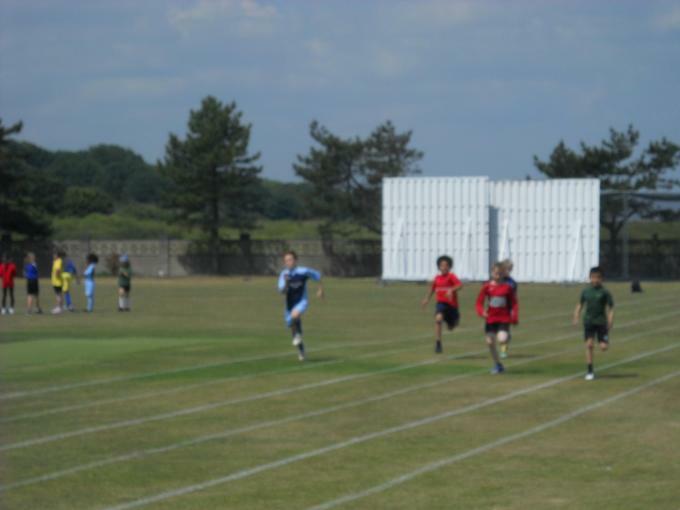 The children had a fantastic time participating in our Sports Day this year. 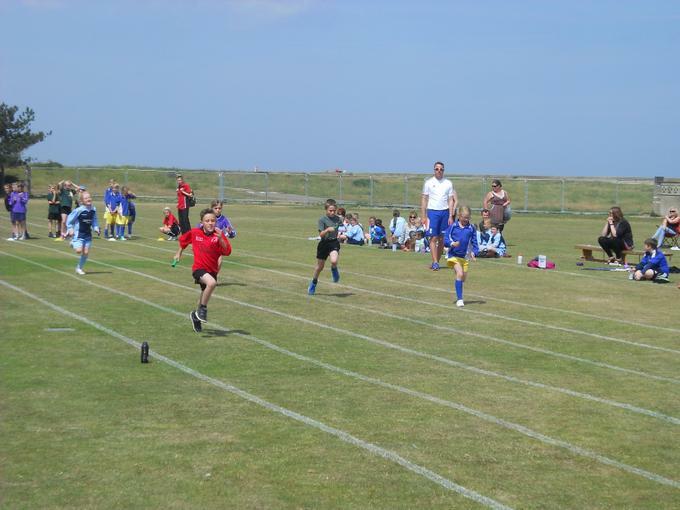 KS2 children took part in the morning and KS1 had their sports day in the afternoon. This year, the children competed in their houses. 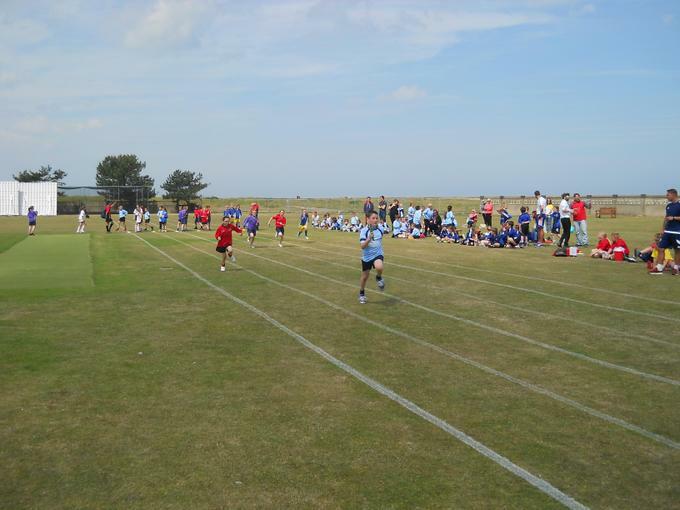 I am pleased to announce that the KS1 winning house was Ruby House and the KS2 wining house was Emerald House. 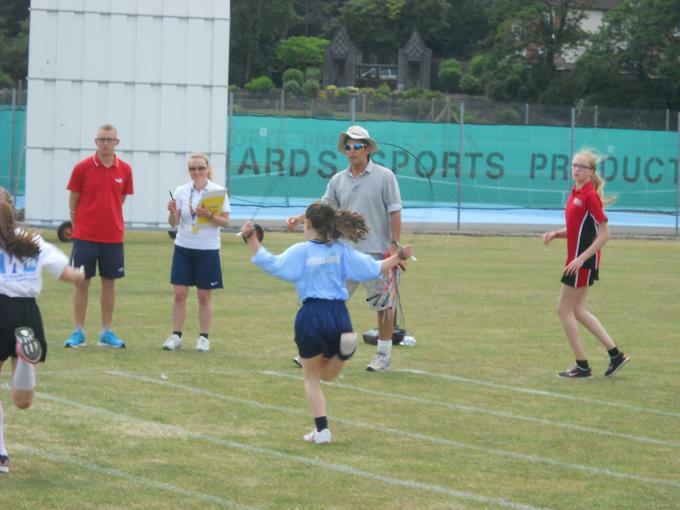 The overall winners were... EMERALD HOUSE! 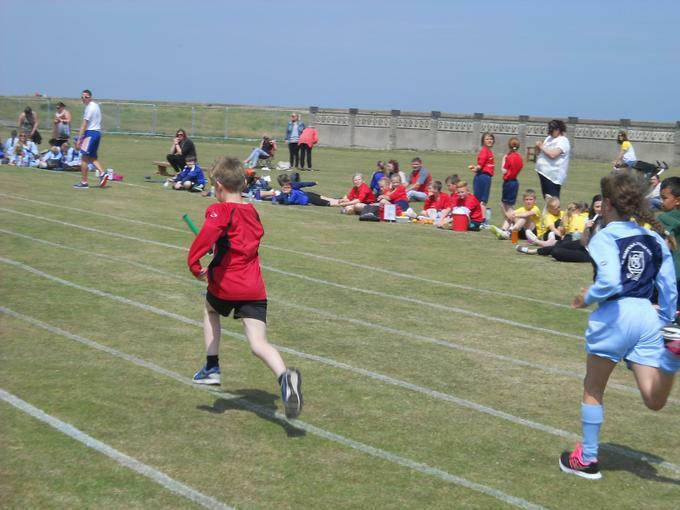 Well done to all of the children that participated, and thank you to all of the staff and parents for your support. Here are just a few of the pictures taken. 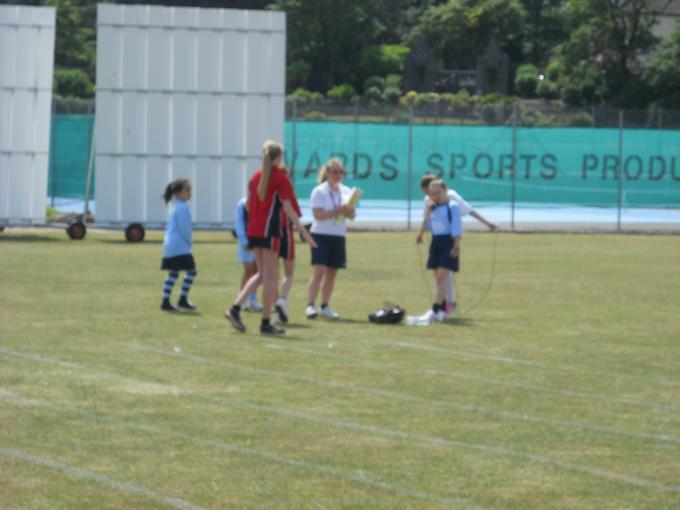 Today some children from Year 5 and 6 participated in a Rounders tournament at The Denes Oval. 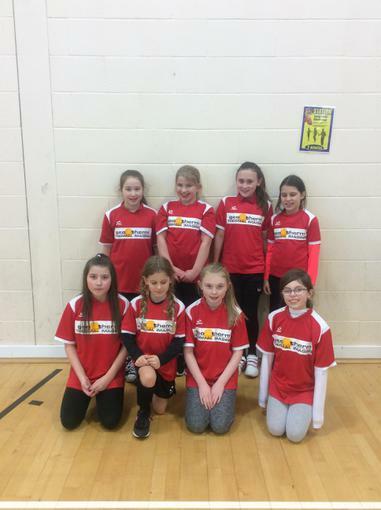 They played brilliantly and finished in 5th place overall. A fantastic time was had by everyone. 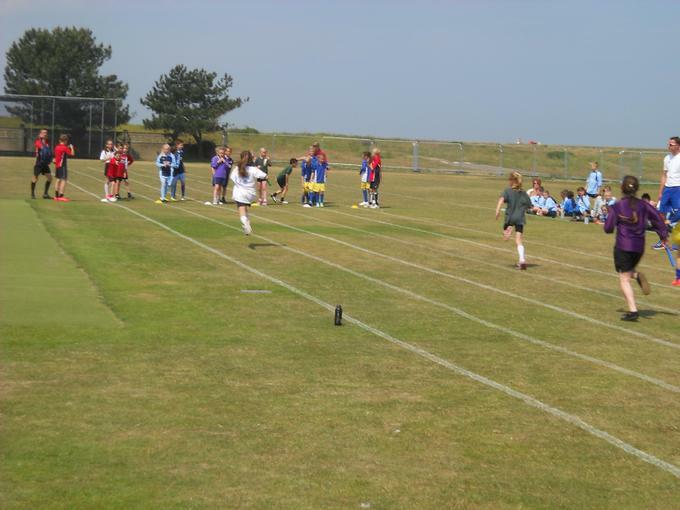 Today some of the Year 4 children from Willow and Fern classes participated in an athletics tournament at The Denes Oval. 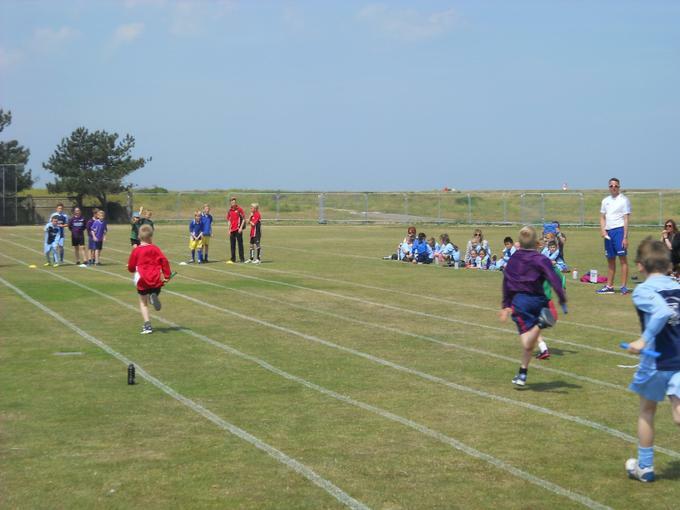 They competed in many events such as the 100m sprint, the long jump, the tug of war and the relay race. They tried extremely hard and it was a fantastic afternoon. Well done everyone! 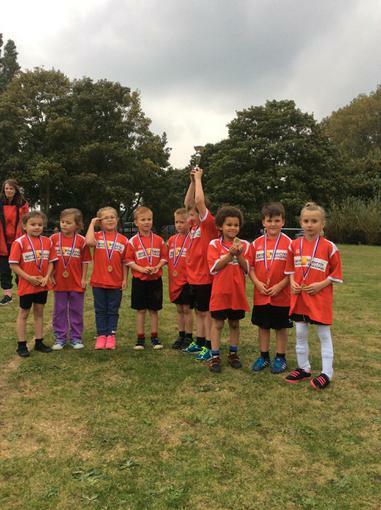 Thursday 12th March- Year 2 winners at Under 7 football! 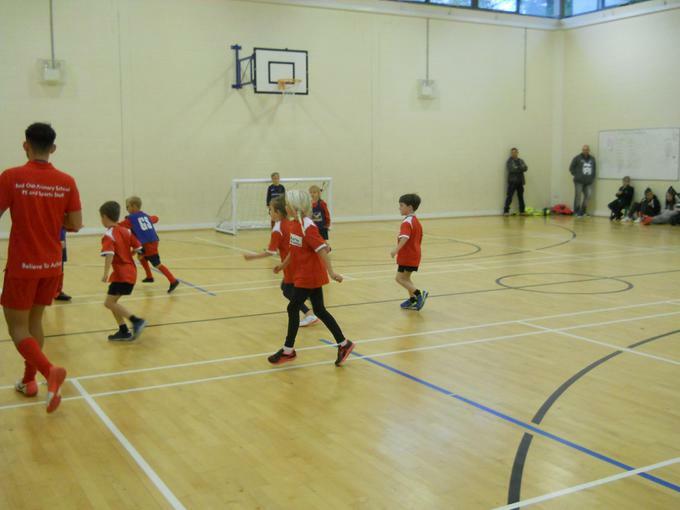 After school today, some of our Year 2 children visited Red Oak Primary School for a friendly football fixture, against Westwood and Red Oak Primary Schools. 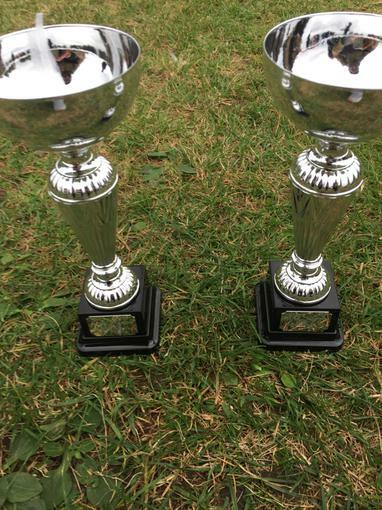 There were two leagues, and we are delighted to announce that we won both of them! 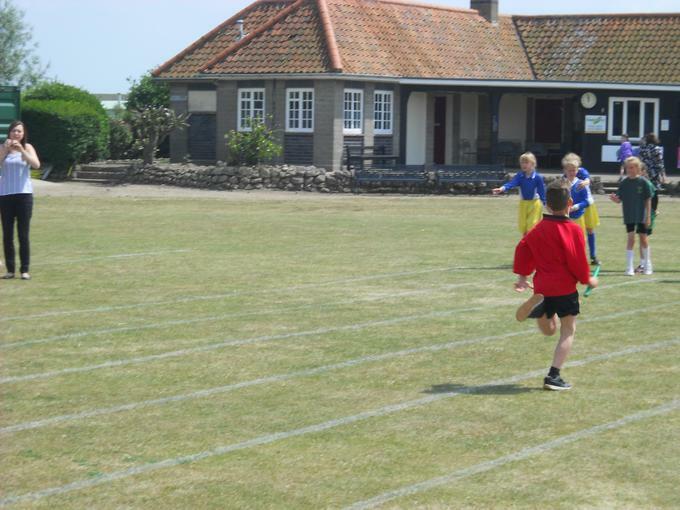 The children behaved impeccably and represented the school extremely well. 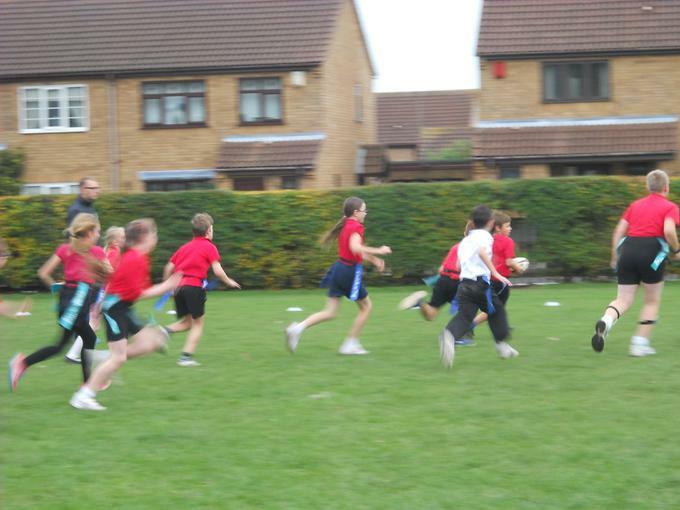 Below are some photographs of the children in action. 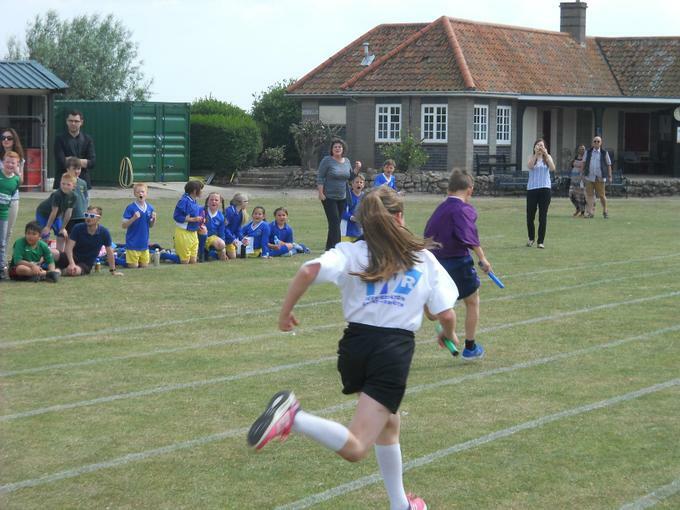 We are delighted to be taking part in a number of exciting sports tournaments this month. 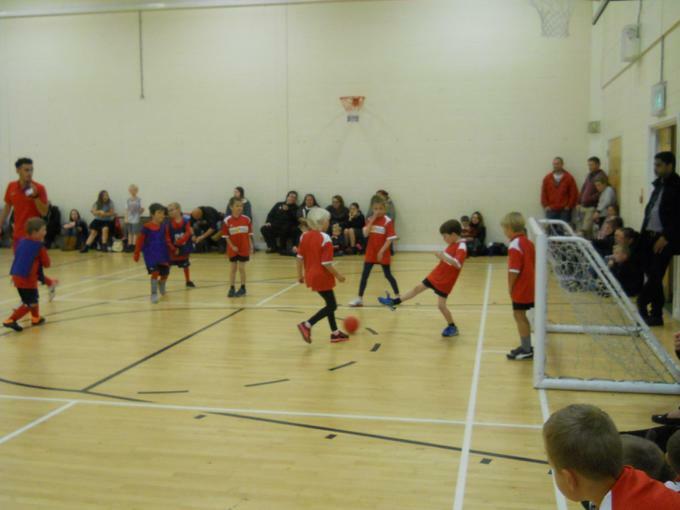 These tournaments offer the children the opportunity to extend and apply their skills which they have been learning in lessons. 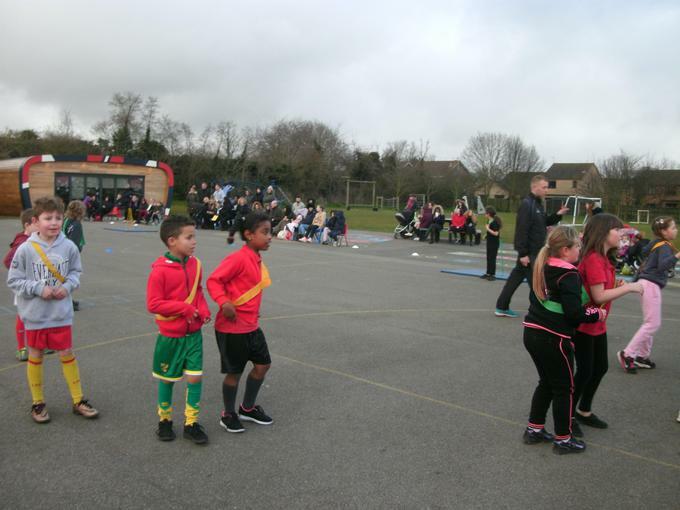 Thursday 12th March: Year 2 friendly football tournament at Red Oak Primary School. 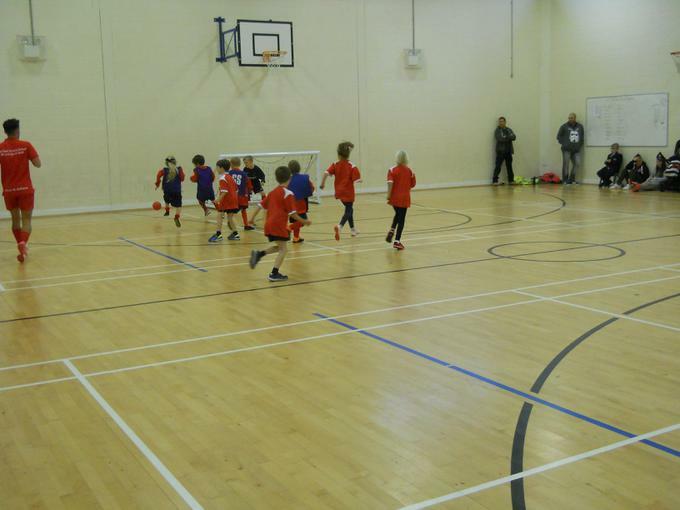 Tuesday 17th March: Year 5 7-a-side football tournament at East Point Academy. 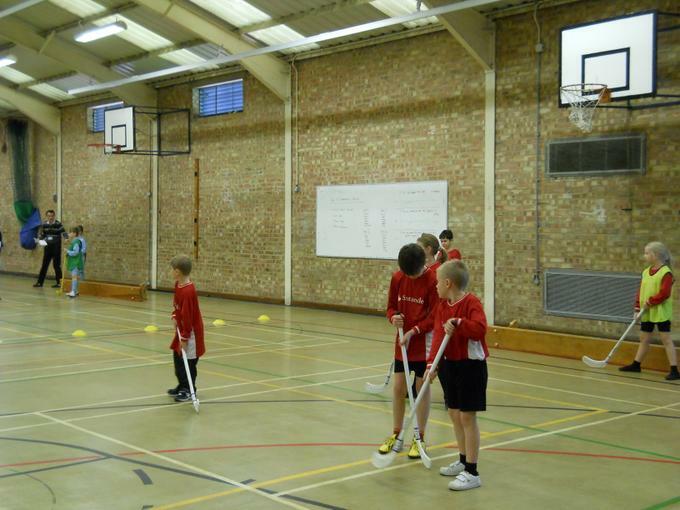 Thursday 19th March: Year 5/6 Quicksticks tournament at East Point Academy. 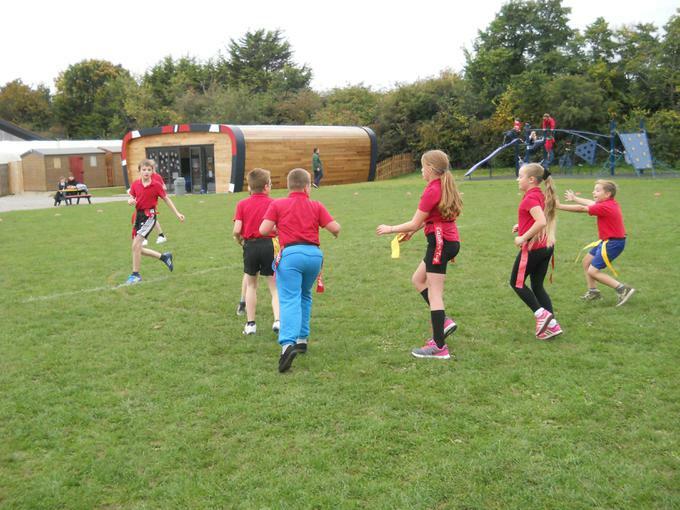 It has been a very busy, fun-packed week for sports at Grove Primary School! 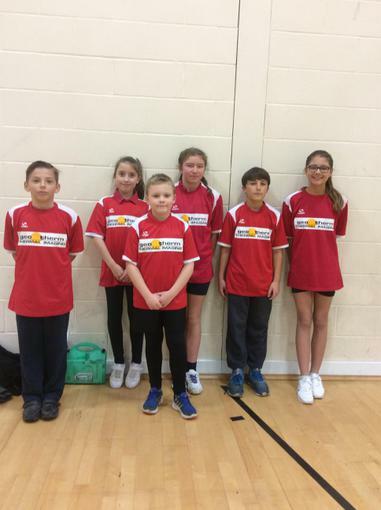 On Wednesday 21st January, some Year 5 and 6 pupils went to Waveney Sports Centre to take part in the under 11 Indoor Athletics tournament, against 20 other primary schools. 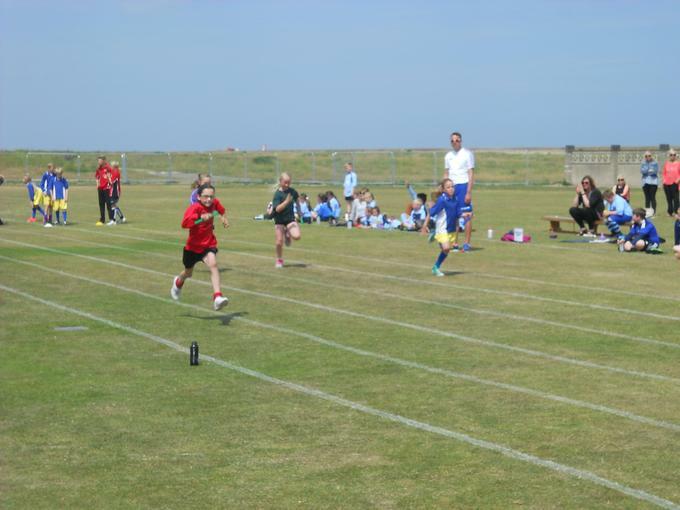 The children participated in both field and track events, including the triple jump, vertical jump, javelin, chest push and relay races. 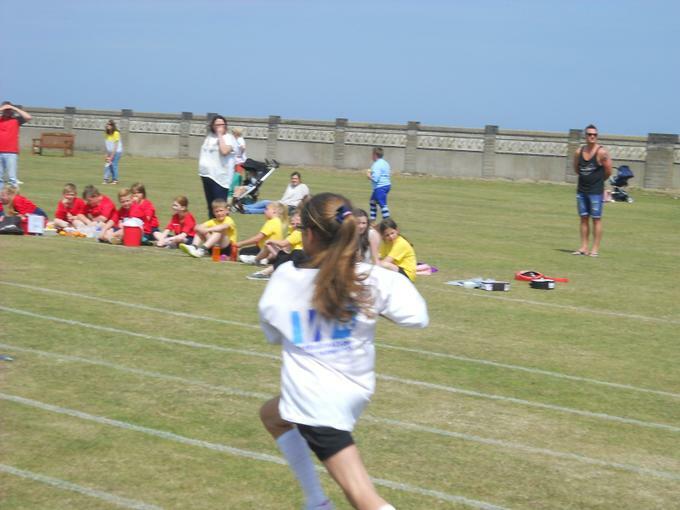 All of the children tried their best, and we finished in 10th place overall. Well done! 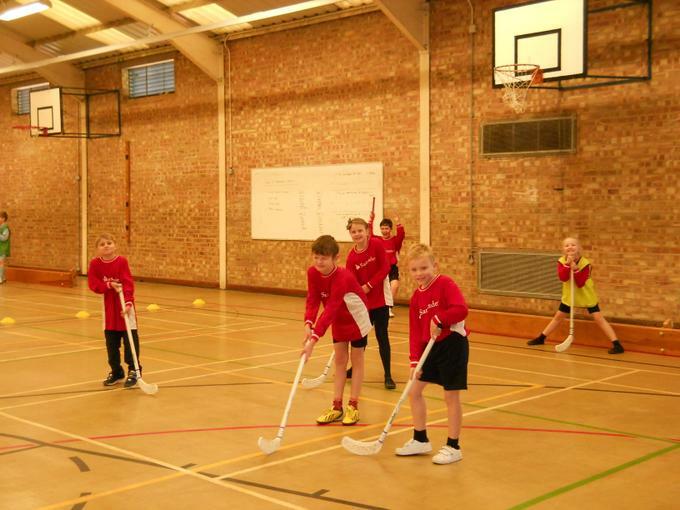 On Thursday 22nd January, some pupils in Year 4 travelled to Red Oak Primary School to participate in a friendly Unihoc tournament. 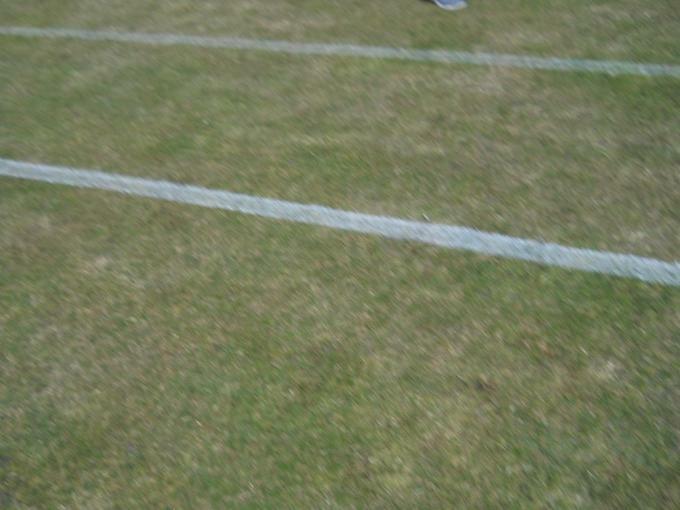 The match was extremely close throughout the four quarters, and we eventually finished the game winning 6-3. 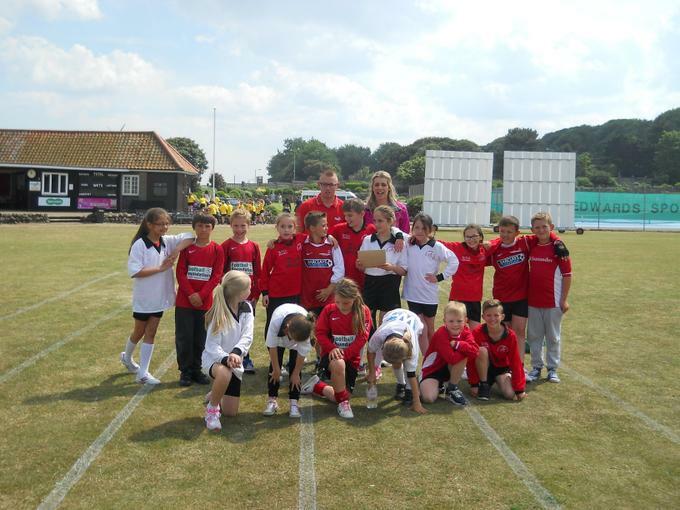 The children behaved impeccably and represented Grove Primary School brilliantly, showing sportsmanship and pride. 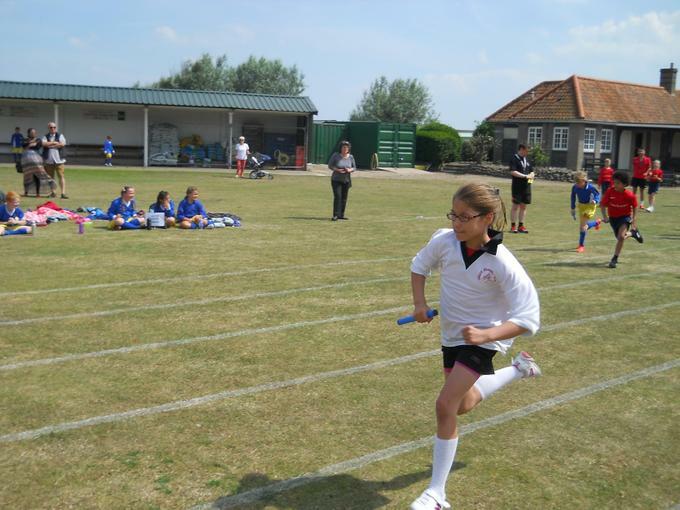 Well done to all of the children who took part from Grove and Red Oak. 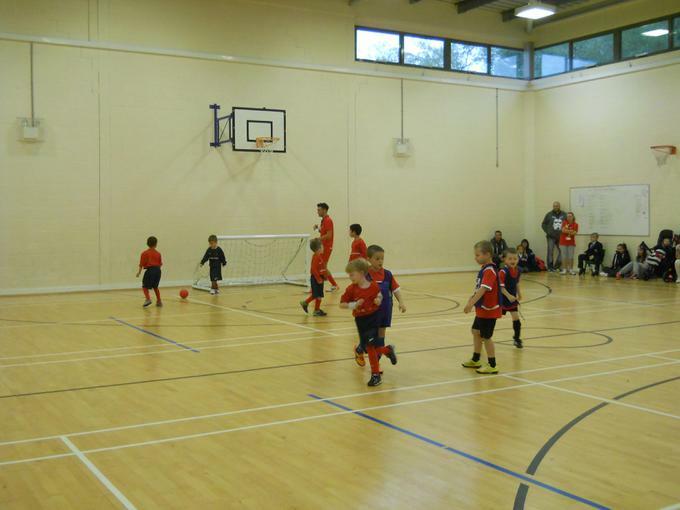 We are very excited to be taking part in two tournaments this month. 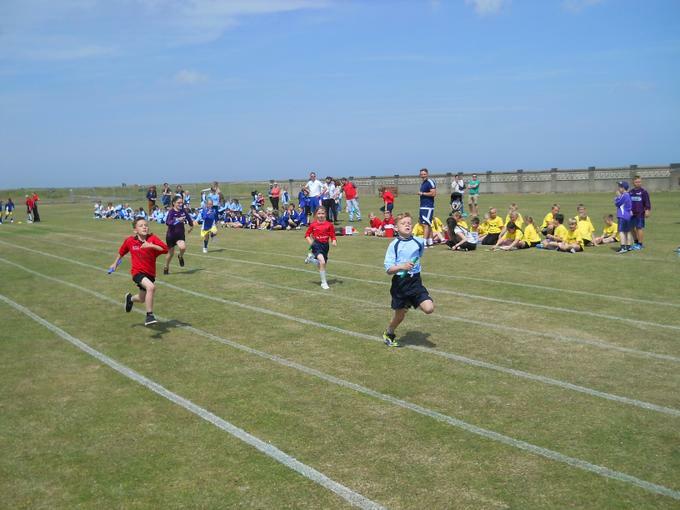 Firstly, some Year 6 children will be competing in an Indoor Athletics tournament on Wednesday 21st January. 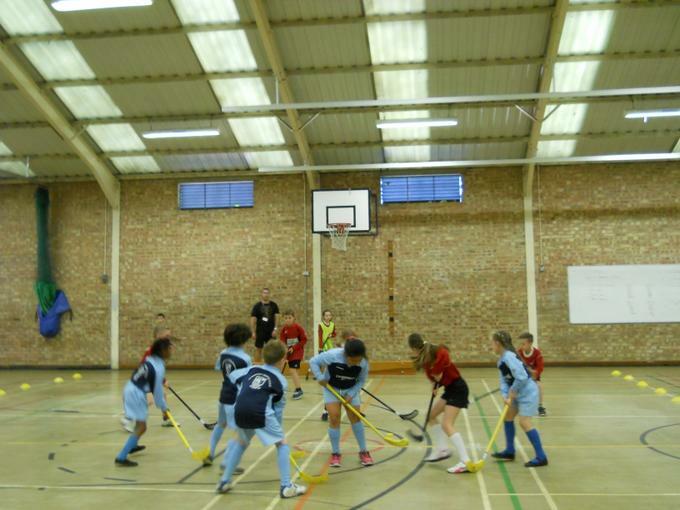 Secondly, there will be a friendly Unihoc tournament the following day, Thursday 22nd January. 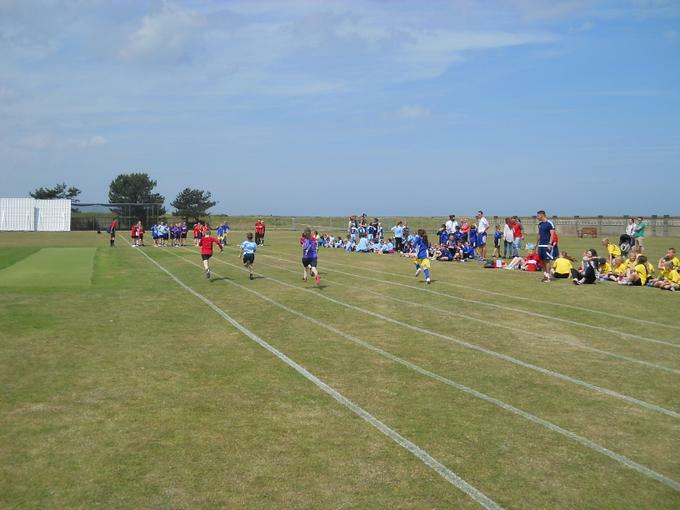 Please check this page for scores, information and photographs. 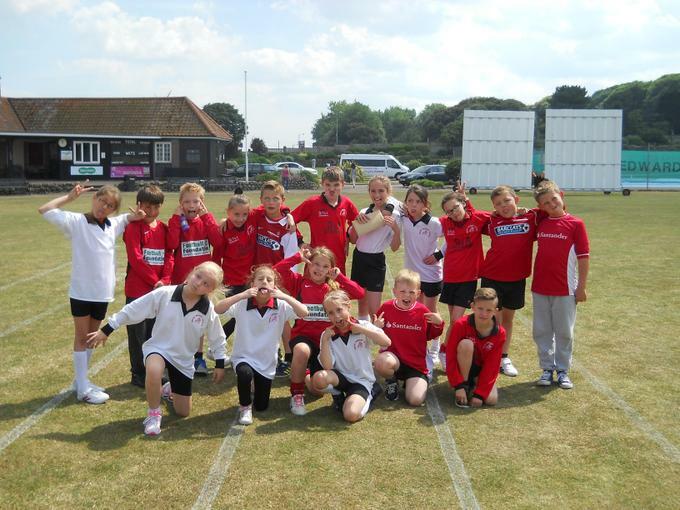 Good luck Grove Primary School! 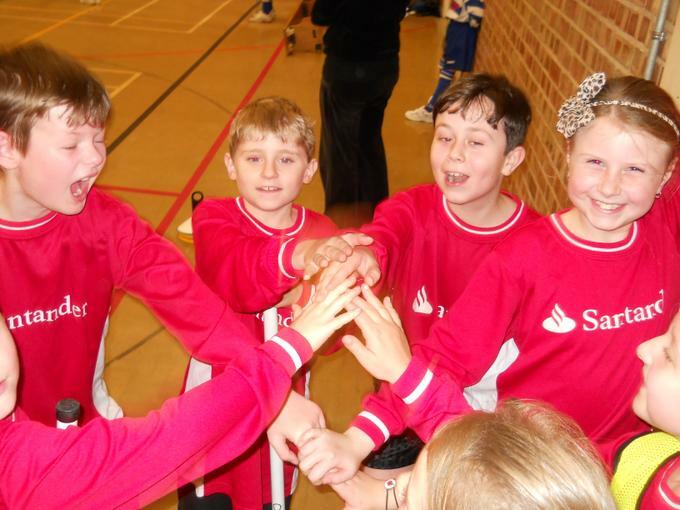 Congratulations to our Year 4 Unihoc teams who came 1st and 3rd in the tournament at EPA on Thursday 6th November. 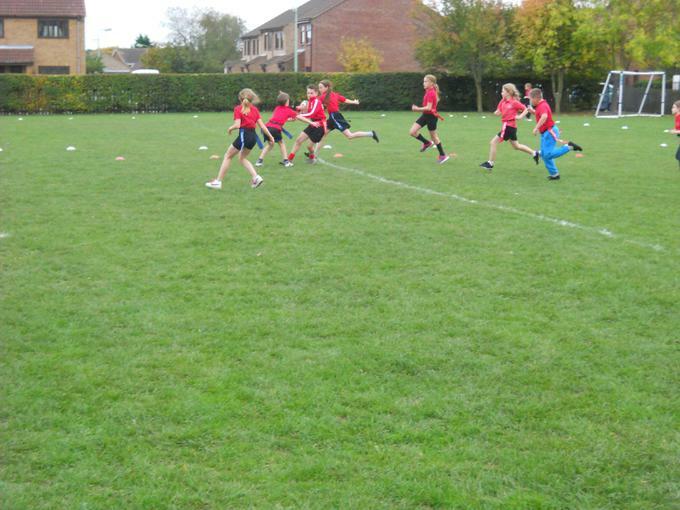 Our Year 2 and Year 4 children enjoying their exciting PE lessons!